The Purotwist RO System conforms to NSF/ANSI Standards 58 for performance claims as verified and sustained by test data. All pre andpost filtration demands were removed prior to contaminant reduction performance testing by the Water Quality Association laboratory. 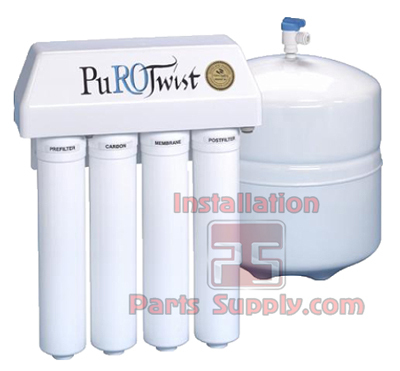 The Purotwist reverse osmosis drinking water system is designed for easy installation and maintenance. Please note thatroutine maintenance is essential to the longevity and performance of RO systems. Filters should be changed every six months depending on the quality of the feed water supply.The Purotwist RO installation should comply with all state and local laws and regulations. Manufacturer recommends a TDS test every six months. This system is acceptable for treatmentof influent concentrations of no more that 27 mg/L nitrate and 3 mg/L nitrite in combination measured as N and is certified for nitrate/nitrite reduction only for water supplies with apressure of 40 psig or greater. This reverse osmosis system contains a replaceable component critical to the efficiency of the system. Replacement of the reverse osmosis component shouldbe with one of identical specifications, as defined by the manufacturer, to assure the same efficiency and contaminant reduction performance. Stage 1 5 Micron Sediment Filter; Removes dirt, sediments, sand, and other physical particles. Stage 2 Pre Carbon Filter: Provides protection to the RO membrane from free chlorine and sediment. 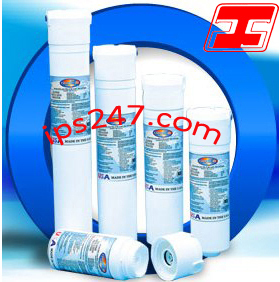 Stage 3 Reverse Osmosis Membrane: Membrane reduces a high percentage of dissolved inorganics. Stage 4 Post Carbon Filter: A final polishing process that enhances and clarifies your drinking water.